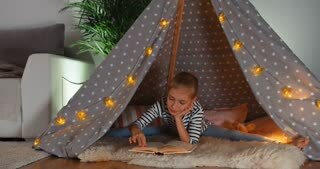 Two little girls play at home in the evening to build a camping tent to read books with a flashlight and sleep inside. Concept of: game, magic, creativity, alarm systems. View of the colorful ethnic wigwam in the yard. Small indian house outdoors in the city park in summer. Lovely ETHNOGRAPHIC, old wooden village with few houses, wigwam and fence. One baby crawls away from another child, but then comes back to him. A little boy studies the garland when his little friend crawls away from him. Two cute baby boy eat cookies on the background of a children's tent. A child is trying to take another baby's cookie. One happy cute baby jerking a garland in a children's tent. The child has played enough. Cute baby claps his hands and falls to the floor. The second child creeps past him. Two kids playing with a garland in a children's tent. One boy crawls away from another. The kid is left alone. Little girl playing with teddy bear in tent under the table. Very beautiful and little girl playing in a tepee. 1960s: Low angle close up, boy wearing headdress. Long shot, boys by tipis. Kids at table watch man stamp on paper. 1960s: Close up, hands sew headdress. Boy in headdress walks from camera, toward boys making tipi. Boy watches boys construct tipi. Playful young parents and adorable baby in small wigwam playing hide-and-seek game having fun. Caring father and his toddler daughter are sitting inside tent at home. Father reading to his daughter and asking to find things in the book then hugging and kissing her. Caring father and his toddler daughter are sitting inside tent at home. Father reading to his daughter and asking to find things in the book. Small boy in suit of native American playing with toy ax near wigwam having fun at home.